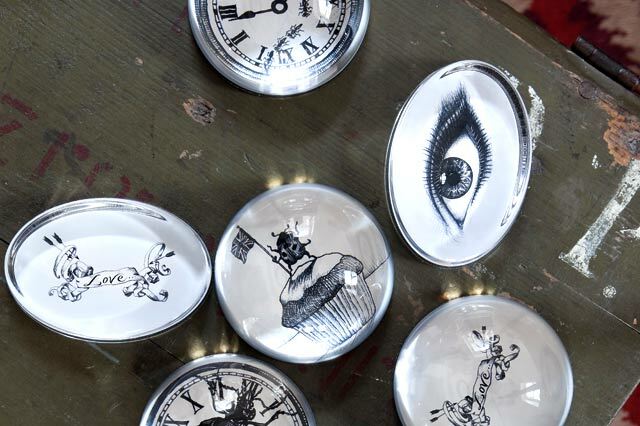 ABOVE: London-based artist Rory Dobner’s drawings take shape in all manner of forms: here, a selection of precious lead crystal glass domed paperweights. Melding multi-disciplined art and interior design, a dynamic duo set to storm the UK design hotspot. 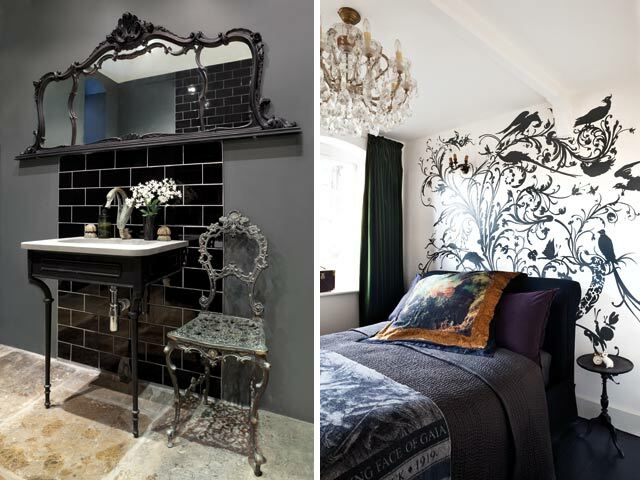 When award-winning interior designer Sean Cochrane’s wife, Millie, pointed out an intricate ink drawing on an excursion to Liberty’s, he knew instantly that an alliance of creative minds was on the cards. Complementing the display of bewitchingly-detailed works, a few ‘offbeat pieces’ such as a lamp crafted from an antique shoe horn attested to the artist’s skill and reinforced Sean’s recognition of a talent that would be an asset to the projects he had in development. Destiny ran its path of providence when, a week later, Sean happened to find himself seated next to artist Rory Dobner at a lunch with Noel Gallagher’s ex-wife, Meg Mathews, the music industry entrepreneur-turned-wallpaper and scarf designer. ABOVE LEFT: A collection of exquisite hand-drawn illustrations include commissions for pets in character-ensemble and the logo image for Mayfair store, Shizaru. 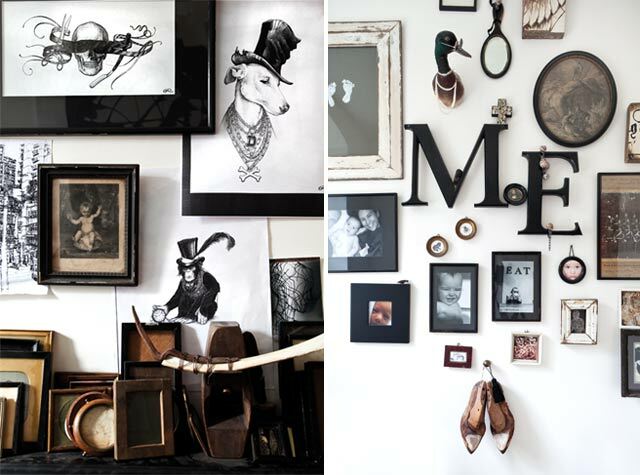 ABOVE RIGHT: Vintage shoes, family photographs and all things dear to her heart bedeck the walls of Rory’s wife Claire’s study. 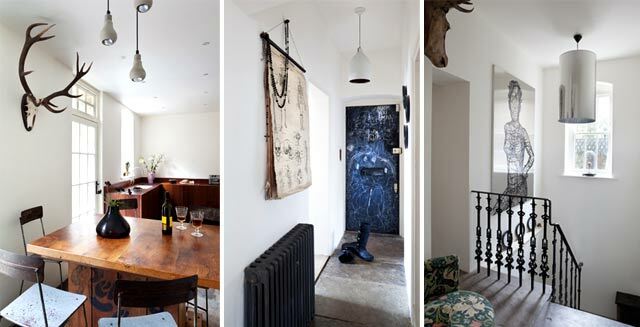 The Dobners’ restored Victorian terrace in Hampstead is, on the surface, traditional and typical. A low-rise, grey-brick building comprising one- and two-bedroom flats, it claims historical note on two accounts. Having been built in the 1850s to provide housing for servants of the nearby affluent families of Flask Walk, a Camden Council document stipulates it as the second-oldest surviving example of council-housing in Britain. Nearly a century-and-a-half later it gained notoriety when Sid Vicious and Johnny Rotten made temporary residence in one of the flats, their drug-induced antics leaving behind an indelible presence that visiting tourists to this day bear witness to. ABOVE LEFT: The kitchen counters are reclaim-ed cherry wood science lab desks. ABOVE MIDDLE: A blackboard-clad door offers the Dobners’ sons opportunity to explore their own artistic skills. ABOVE RIGHT: Rory’s black gloss on stainless-steel artwork dramatically offsets the Victorian charm of the York stone-clad staircase, iron balustrade and Morris-inspired chair upholstery. Two weeks after Rory and his wife, Claire, moved in they discovered they were expecting their first child… so it was an act of welcome serendipity when the flat next door went up for sale. They snatched it up, knocking the two together and excavating beneath the existing one to create a basement floor. Six years on sees a home that clearly pronounces the occupation of both the creative and the children. At the end of a passage a large chalkboard mounted to the back of a door displays the hereditary artistic potential of the Dobner boys, Louie (5) and Huxley (2). Such informal gestures are held surprisingly well within an interior that has been carefully restored in accordance with English Heritage standards. Authentic Victorian handles and hinges on doors and windows, wrought-iron balustrades, floors of reclaimed York stone and walls featuring Gothic curves complete the period detailing. The interior is simple by design. For one, the intention was to refrain from competing with the inherent elegance of the interior elements and, two, to platform Rory’s artwork and the eclectic mix of furnishings. ABOVE LEFT: The Dobners’ home, though clearly the product of a creative pair, celebrates family – and the presence of their two sons is made known. 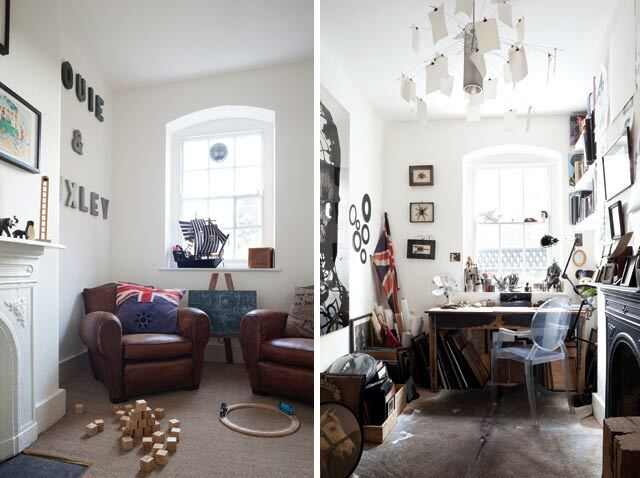 ABOVE RIGHT: Rory’s study is part studio, filled with collected curiosities. ‘Like his work, Rory’s home manages to twist through the decades,’ says Sean, ‘blending mid- and turn-of-the-century and underscoring with the contemporary.’ Almost every item brims character and elicits conversation. Louie’s bed was discovered at the Clignancourt Market in Paris, its bold black and white Romo stripe softly tempered by a patchwork quilt made from old baby-grows. In the kitchen, 1950s cherry wood chemistry desks (complete with Bunsen-burned holes) serve as low-level kitchen units. Rory’s study is the real treasure chest: it’s filled with books, antique frames and all manner of collected objects that fuel his artistic expression. The home displays an expansive repertoire: quirky paperweights, a curious coffee-table, ornate lamps and (naturally) exquisite line drawings manifest on walls in framed clusters, brushed stainless-steel and, in the main bedroom, a flourish of a mural. ABOVE: The coffee table and table lamp, designed by Rory, sit comfortably within a period space anchored by Vivienne Westwood’s vibrant Squiggle Orange rug. For Sean, who goes to great lengths to source and commission unusual, bespoke items, the modern yet timeless quality of Rory’s work is perfectly befitting of the high-end turnkey residential projects he co-ordinates. BELOW LEFT: Secreted away in the basement, the bathroom is a dramatic yet soothing space where Rory and Claire ‘escape to dream’. BELOW RIGHT: Rory’s feathered, tendrilled flourish makes for whimsical slumber.